When Design Meets Technology, “Auto-Magic” Happens. As you can clearly see, this futuristic home in South Africa is truly like none other. Between the best-of-the-best in architects, interior designers and technology experts, it features unsurpassed quality, aesthetics and performance. With the use of a Control4 home automation system, you can make this Thanksgiving dinner easier and more efficient than ever. Here are five reasons why. Thanksgiving, Christmas, and Hanukah are approaching fast – it’s hard to believe 2015 is almost over. While you start thinking about your guest list for holiday celebrations and your Christmas or Hanukah shopping list, take some time to get in the holiday spirit with smart home automation. Here are our three tips for using your smart home for some holiday fun. Because so many of you enjoyed the tunes we hand-picked for your trick-or-treaters and party-goers, we figured we'd take the work out of finding a holiday playlist for you as well. Why Do Control4 Customers Love their Smart Homes? We Asked. They Answered. We took to Facebook and Twitter to have our friends and followers fill in the blank: I love my #SmartHome because _____. Here's what they had to say. With November being National Child Safety and Prevention Month, we thought we'd share 8 tips on how home automation can help keep your kids safe at home. First the bad news: Chances are, you could be getting a LOT more out of your home entertainment system. The good news? Today’s advances in AV will add some snap, sizzle, and pop to your movies and music, programs and sports, dinner parties and bashes. Get ready to boost the quality and resolution of your home AV and almost blow the ceiling off of your entertaining limitations. ...So it seemed fitting that with Halloween just a few nights away, we give you quick-access to some streaming stations that we have cherry-picked for you—all complete with scary (or fun) sounds and songs to play for your door-to-door tricksters or party-goers. Here are a few soundtracks and playlists from Pandora, Rhapsody, TIDAL & TuneIn—sorry Deezer-lovers, the service isn’t available in the states just yet, so we weren’t able to help with your playlist picking, but I’m sure you’ll find some good picks below! From a gadget that safeguards our garages, to tech that takes the tedium out of entertaining, there’s just no denying it: home automation is changing the way we live. And with a Control4 system at the helm, this revolutionary technology is transforming every room in our homes into a hub of home automation. How, exactly? Today we’re exploring just that! So join us as we take a tour of the 5 rooms where home automation is making our lives that much easier, secure, and enjoyable! It’s a given. Demand for smart home technology is growing at a rapid pace and consumers from around the globe are integrating Control4 to enjoy the magic of living in a home that can automatically respond to their hectic lifestyles and families’ needs. 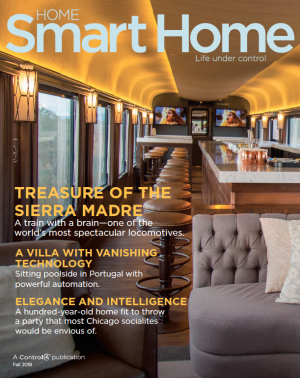 Today in Dallas at the CEDIA Expo (the global showcase of all things related to the connected home), we rolled out Control4 OS 2.8, the latest version of our smart home operating system. For Control4 customers, this means a BIG boost in the areas of home security and entertainment. My husband and I have our respective can’t-live-without features in our Control4 smart home. But the one thing we share a common love for is the whole home audio system. We are definitely a family driven by the beat of a tune. That's why I'm beyond excited to share some cool news with you today. Product Launch Event: Watch it Here Live! We are gearing up for another great show at CEDIA 2015 in Dallas, TX. Just like last year, we are hosting a killer party and livestream event prior to the show. If you can’t be there in person, be sure to join in for our livestream event to learn all about the latest and greatest from Control4. WATCH IT HERE LIVE ON 10/14 @ 9:00PM EST / 8:00PM CDT / 7:00PM MST. The possibilities for home automation are limitless, from lighting to home theater and more. Here are 78 home automation ideas to get you started! You may have caught our first feature on vacation rentals, where we cover our “Top 10” favorite summer ‘smart’ spots. Now that the leaves are changing and the weather is getting cooler, we thought we’d share our “Great 8” favorite fall and winter destinations that are outfitted with home automation. Whether you’re looking to visit Park City for the Sundance Film Festival, or hit the ski slopes in Whistler, Telluride or Deer Valley, each of these vacation homes are buzzing with Control4 smart home technology to make your stay even more comfortable, convenient and entertaining when you get in from the cold. A "Shoulder Phone" from Japan, a computer for the Amish, and a rechargeable highway...those are just a few of the fun facts you'll discover here! The “Man Cave” is said to be the “last bastion of masculinity” within the home, and whether your sanctuary is in a garage, spare bedroom, basement or media room, there are many ways that you can make it even cooler...way cooler than adding neon signs, mini-fridges, or even your favorite team’s memorabilia. In fact, integrating a variety of devices, sensors and programming into an automation system can make your personal space into something you might want to share with everyone! When a home's design—not technology—needs to take center stage, Control4© is the solution you can trust to orchestrate your smart home while complementing and blending into your home’s aesthetic. One Arizona home, built to complement and showcase the desert landscape around it, is a spectacular example of this. Cinemagic, a home electronics installer in Scottsdale, Arizona, needed to deliver home automation that would enhance the natural and aesthetic beauty of this home. A Control4 home automation system would be a key part of this installation.